Put the water in a bowl, sprinkle in the salt and yeast, and stir until everything is dissolved. Add the flour – you want somewhere between 5 and 6 cups, the aim being to create quite a sloppy dough. Mix it all together with your hands, but just for long enough so that it’s even. More flour gives a firm dough which in turn will result in a very dense loaf, whereas less flour makes for fluffier bread, so really the moister the better (Morgan insists that “moister” is not a word, but I think it’s perfectly cromulent). If the dough sticks annoyingly to your hands, it’s a good sign. Once the dough is mixed, cover the bowl with a damp tea towel and put it in a warm place for 18-24 hours. On top of (or even inside) a rack of computer equipment is ideal, but if you don’t have one of those, a warmish room will work fine. The tea towel will dry out eventually, so make sure to keep it damp, say, with a spray bottle of water, or just take the towel off the bowl and run it under a tap. After 18-24 hours, tip and/or scrape the dough out of the bowl, and roll it around in some more flour. Bonus points for folding it a bit and ending up with a nice round ball shape. 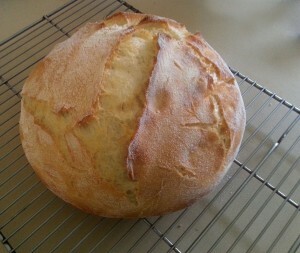 Rice flour is excellent for this part of the process, because it gives the loaf a nice golden outer crust. Put the dough back in the bowl under the tea towel for about another hour. Finally, the baking. Put a cast iron pot with lid in the oven and preheat to 250°C. If your oven won’t go that high, just put it on maximum. Once oven and pot are nice and hot, wrangle the dough into it, put the lid on, and bake for 35-45 minutes. I usually set a timer for 35 minutes, then pull the bread out and stab it with a knife to see if it’s done. If the knife comes out clean, you’re good. If there’s a bit of sticky stuff on the knife, return the bread to the oven for another 5-10 minutes. Once it’s done, take the loaf out and let it cool on a rack for a little while, then eat and enjoy! This entry was posted in Uncategorized and tagged Cooking by Tim Serong. Bookmark the permalink. a) might fine looking bread! Hanging out to make your gorgeous looking bread- but how big’s your baking pot- I’m guessing it’s about 4- 4/12 quarts but don’t want to get to baking stage and discover it’s not big enough. All my measuring stuff is in litres If I fill the pot to just below the brim with water, it’s about 4.5L, which is slightly over 4.5 quarts – so it might even be close to a five quart pot. I reckon you’d still be fine with a 4.5 quart pot though. Thanks for getting back to me so quickly I’ll have gorgeous, warm bread smells through my house by Sat morning.